From the Editor: Heather Field is a passionate advocate for blind children. In her articles and workshops she often challenges conventional ideas about blind children's needs and abilities, encouraging adults to enter into the child's point of view. In this article, based upon a presentation she gave at the NOPBC Conference in 2015, she emphasizes the critical importance of play for the healthy development of all children, including those who are blind. I'm originally from Australia, and I've lived in Tennessee for the past seventeen years. I have a master's degree in special education, and I have taught for over thirty-five years, working in early intervention, elementary education, tutoring, and consulting. I run a small private preschool and tutoring business from my home, and I happen to be blind. Before I go on, let me define my terms. When I refer to blind children, I am not just speaking about those children who have no usable vision. I am referring to all children whose vision is not "functional." By saying that their vision is not functional, I mean that they cannot rely on their vision alone to perform the functions of daily life. They must also use alternative, nonvisual techniques. Low vision and visually impaired are other terms for functionally blind. Most professionals prefer to use these terms, but I use the term blind. Blind refers to the vision these children don't have, and that's really what's making the difference. According to the Oxford English Dictionary, facilitate means to "Make (an action or process) easy or easier." So we're not talking about teaching blind children what to do; we're talking about being part of the process to make it easy or easier for them to play. But what exactly is the process of playing? The dictionary says that to play is "to engage in activity for enjoyment and recreation, rather than a serious or practical purpose." Yes, we play for enjoyment. Do sighted children enjoy playing? Yes, they get great joy from playing with others, even as very young babies. But how do they know which activities will bring them enjoyment? Do we facilitate the play of sighted babies? Oh, yes we do! We smile, make funny faces, make funny noises, tickle their hands and feet, and shake rattles. We present them with a range of activities that they might enjoy, and they choose which ones they will engage in with us. If they don't respond to your smile with a smile back, you make funny noises, blow raspberries, and stick out your tongue till you get a smile. You make the process of play easy for your sighted baby by giving him lots of possible play options and engaging with the ones he appears to enjoy. This process continues throughout childhood. You might invite a toddler to brush your hair with a toy brush. When a preschooler brings you a cup of pretend coffee, you might say you'd like a bowl of cereal, too. With an older child you may suggest a board game or offer to play catch out in the yard. Children also facilitate play for each other. I remember observing some of my pupils playing "wedding" around the time of the royal wedding of Prince Charles and Lady Diana. One little boy, Raheem, didn't want to be the husband. The girls assigned him to be the uncle, but he didn't care for that, either. Then they assigned him to be a little brother, but he didn't like that idea any better. Finally he ended up being cast as the dog. Through all of these changes, the girls facilitated Raheem's play. We certainly facilitate the play of sighted children, so naturally we need to facilitate the play of blind children, too. This is not something we need to do because the child is blind. We need to do it because we facilitate the play of all children. Can you guess why Raheem didn't want to play husband, visiting uncle, or little brother? He was an only child of immigrant parents, and his father worked nights. He didn't know what his father did as a husband, and he had no visiting relatives. He didn't have a pet dog, either, so he always ended up being sent outside of the playhouse for being a bad dog. This had nothing to do with vision; it had everything to do with lack of experience. Having established all that, let's now look at how sighted adults play with blind babies, toddlers, and preschoolers. The scant research we have, including anecdotal records, suggests that most sighted adults play with young blind children as if they were broken sighted children. Most sighted people have interacted only with young children who are sighted, and they have certain expectations for how young children should interact with them. When blind children don't interact in the expected ways, the adults usually choose one of two responses. They may decide that the child isn't interested in playing with them and leave her to herself; or they may decide that the child should physically be made to interact as much as possible like a sighted child would. Neither of these options results in our dictionary definition of play, with the child "engaging in activity for enjoyment and recreation, rather than a serious or practical purpose." We have observed the tragically delayed development of young sighted children raised in institutions where they were not played with. Based on these outcomes, we know that the choice to leave the young blind child to his own devices—to invent his own play experiences—will not turn out well. The delayed development of deprived sighted children strongly suggests that the lack of appropriate interaction with adults and/or other children, and not the lack of vision, causes aberrant behavior and delayed development. What about the second approach? What about taking hold of the blind child and moving her hands and feet, putting her arms and legs and body where they need to be to make her do what a typical sighted child would do? I am not referring to physical therapy, where this is usually just what needs to happen. I'm referring to playtime. This approach of manipulating the child's body is based on the assumption that, because the blind child can't see what people do with the objects in the world around her, she must physically be shown what to do. Unless someone puts her through the motions, she won't know or learn, because sight is the only way to learn and she doesn't have sight. This way of thinking about blind children as lacking what they need in order to develop normally is known as the deficit model. 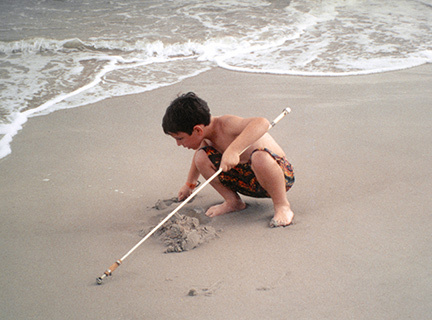 It is promoted by many sighted professionals who advise parents regarding their blind children. Consider this passage in a handbook for parents published by a prominent blind children's organization: "Vision is the primary source of information for most children. No other sense can stimulate curiosity, integrate information, or invite exploration in the same way, or as efficiently and fully as vision does." If the deficit model of blindness is true, then your blind child's curiosity will never be stimulated as much as that of a sighted child; he will never be as tempted as a sighted child to explore his world; he will never be able to integrate the information he gathers about the world as fully and efficiently as a sighted child. He won't be able to do any of these things because he doesn't have vision. Clearly, the writer of this handbook has never been lost at fairs and in shopping malls and in carparks with the sighted people I've had to provide with the information they needed to get unlost! Here's another quote from the handbook: "Since 85 percent of all early learning is visual, the child who is blind or visually impaired is at great risk for developmental delays. Effective, intensive intervention is imperative in the early years. ... Early vision loss affects every area of development, including cognitive, social, emotional, communication, self-help, and both fine and gross motor skills. The unique educational and developmental needs of children with vision impairments can best be assessed and interpreted by qualified educators." As you may imagine, I disagree strongly with these claims. I do so based on the evidence, which is more than what appears to have been used in composing this handbook. Firstly, many blind people grow up to be as normal as the next man or woman, without any effective and intensive early intervention from specially qualified educational professionals. I am one, and Dr. Jernigan was another, and there are lots of others at this convention. As children, these people simply had parents and other family members who found nonvisual ways to facilitate their learning and play experiences. Secondly, and I am constantly dealing with this phenomenon, many blind children emerge from these early intervention programs having received little or no effective assistance, but having acquired a bunch of antisocial behaviors. Too often they acquire attitudes of passivity and fearfulness that they must be helped to discard—not to mention the erroneous information and expectations that have been communicated to their parents. The handbook claims that "85 percent of information is acquired visually." The inference is that without vision the blind child misses out on 85 percent of the information in his world. However, the blind child will only miss out if he tries to use vision to gather all this information, which, of course, he can't do, because he is blind. Vision is the sense through which a child gathers information if he is sighted. Given the innate, internal drives to move and to know, a child without functional vision will seek to gather information using his remaining senses. He is a fully functioning blind child, not a broken sighted child. From the child's point of view there is no problem. If people interact with him nonvisually, he will develop normally, even if for some children that development may take longer, particularly if they have additional issues. The blind child will gather information through nonvisual means. However, sighted caregivers aren't used to the nonvisual route, and they are used to taking cues from sighted babies. In the beginning we don't expect any specific reactions from a newborn except for it to cry when it is hungry, uncomfortable, or afraid. As time passes and the baby grows, its brain and body develop, and it reacts in new ways. On cue we change what we do, based on the baby's changing reactions. The baby leads the dance and we follow, familiar with how sighted babies react. The baby makes the connection between his behavior and the responses of those around him. He realizes that he can cause people to do things that he likes. With his sighted parents following along, he makes the transition from being a reactor to becoming an interactor. His parents respond to smiles, eye contact, and directed gaze. The baby is doing other things as well, mind you, but the parents know to look for visual cues from a visual baby. They see them, they respond, and the baby learns to interact. If a baby is to develop in a healthy way, it is crucial that he make the transition from being a reactor to being an interactor. A child who interacts will initiate games and verbal exchanges as ways to make things happen, to get the response she wants. If parents respond to the grunts, shrieks, or pointing fingers of their sighted children, these children take much longer to develop normal language. They don't need words because they achieve successful interactions through other techniques. We know that blind children are not the only children who may be delayed in language development, and we know why certain sighted children are delayed. When a baby is blind, he doesn't use eye contact or directed gaze, and he doesn't react the way his sighted parents expect a baby to react. Though blind babies are perfectly capable of learning to become interactors, this transition is often prevented by sighted parents who don't know what nonvisual actions to look for. Even though the baby is responding to them and their actions, they don't realize it and don't, in turn, respond. The baby is interacting nonvisually, but his cues to make the transition aren't being understood. As a result, he stops trying out his nonvisual interaction because it doesn't cause anything to happen. The sighted adults expect him to interact like a sighted baby, and they fail to look for other signs that he is interacting. In her landmark study on the development of blind babies, Selma Fraiberg filmed the interaction between blind babies and their mothers and the research team member once a month. Then the team reviewed the films to see what they could learn. There was one bright little boy whom they worried about because he didn't seem to be making the connection between sound cues and the objects they represented. They thought he wasn't developing an understanding of object permanence, i.e., the concept that an object continues to exist even when you can't see it or, in this case, touch it. When the researcher rang a bell, the child's favorite toy, the child's face remained motionless. He didn't smile, turn his head, move his body, or reach. It appeared that he had no clue what was going on. Then someone noticed the child's hands. The researcher rewound the video and looked again, this time watching the child's hands carefully. The minute the bell rang, the baby lifted his right hand and curled his fingers into the shape they would form to hold the bell. Then he wriggled his hand as though he was ringing the bell. The child was interacting all the time, but the sighted people were handicapped by their preconceived notions of what to look for. They hadn't noticed the child's attempts to interact with them. Now that we know that blind children, like sighted children, must have play facilitated for them, how do we do it? We start with physical contact. We place the child on our body, lying tummy down on our chest, and we react to his movements, a touch of the hand or the kick of a foot. We use routine songs, rhymes, or sets of words when doing the same things, e.g., stroking or patting the child's back or tapping his feet. Watch for nonvisual clues that he's enjoying the interaction; watch his hands and feet for wiggles. Sit an older child on your lap and play games that involve bouncing, swaying, leaning, or lifting, games played to a rhyme or song that has a clear beginning and end. Use routine words before initiating a game, such as "Ready, set, go!" or "Show me rock-a-bye-baby." When you introduce new toys or equipment, talk about it and make its noise. Then place it beside the child, just touching a foot or leg. It is not necessary to force the child's hands to touch and engage with the toy. The child who has learned to be an interactor, who has grown beyond passively reacting, will investigate if she is interested. If you have fun playing with it, eventually she will take a look. Do sighted babies instantly engage with every toy we present them? When blind toddlers and preschoolers are provided with role-play props such as hair brushes and cups, or with equipment such as swings, slides, and step stools, those who have learned to be interactors will investigate and experiment. However, their early games may not be those you expect; they may not be like those of their sighted peers. You can facilitate other choices by making suggestions and by role-playing with a favorite doll or teddy bear. Be willing to allow the child to find her own way to the game that she eventually makes up. Even very young children can learn to take turns by having to wait for Bear, Dog, and Truck to go down the slide first. Blind children can learn to push their siblings on a swing or in a wagon. It doesn't matter if the wagon has a crash. The sighted children will scream with delight as they see the crash coming, and they'll ask for more. Soon the blind children will be shrieking right along with them. They can also learn to pull the wagon and give toys or siblings a ride, using a cane to prevent bumping into things. They don't need to be made to ride in the wagon before they can pull or push it. You can model splashing and jumping, and your child may or may not copy you. If you've given her enough experiences and nonvisual interactions, she will learn to play and play to learn.